More than 100 retailers in the UK city of Norwich have teamed up with mobile payment and loyalty app provider Droplet to launch an umbrella loyalty scheme that will allow users to earn points every time they make a purchase using their phone. Points earned can be converted into Droplet cash or special offers that can then be redeemed in participating shops, bars, cafes and venues across the city. “We’ve had 3,000 local users sign up to Droplet Rewards already so that shows there is an appetite from consumers to buy local if they are earning something back in return,” says Droplet co-founder Steffan Aquarone. “This made us think. Why not broaden the offer so that, instead of just collecting virtual stamps for one venue, users can also earn points for the umbrella scheme that covers all of our merchants at the same time. British brewer Adnams began rolling out Droplet to its 12 stores and 50 pubs across East Anglia and London in April. It was made available first in Adnams’ pubs in Norwich over the summer before being launched to other locations. 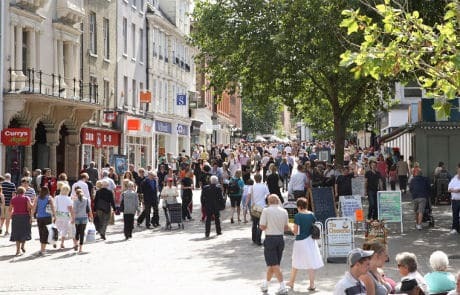 Droplet has also partnered with the Norwich Business Improvement District (BID) to expand Droplet Rewards to further locations across the city.